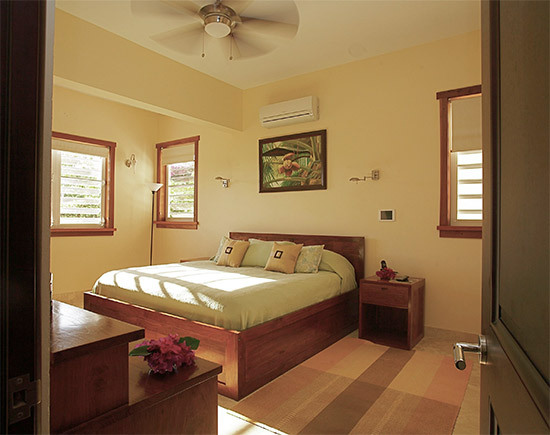 A one bedroom luxury villa set in Little Harbour, Little Butterfly offers all of the comforts of "home" in a tropical setting. 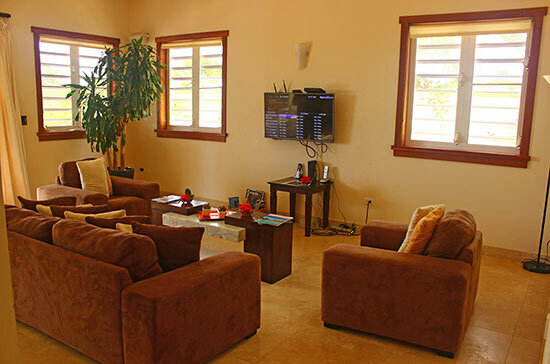 Inside, the villa is spacious and clean, with contemporary and high-end finishings. 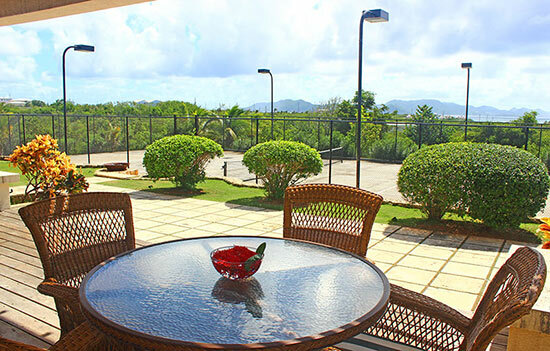 Set in a peaceful garden overlooking St. Martin and the Caribbean Sea, the location takes advantage of its exotic locale, being conveniently located. Here, you're only a short drive to the island's top beaches and restaurants. If you're seeking that feeling of "home" in the Caribbean, look no further than Little Butterfly. 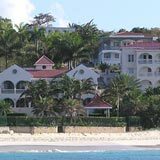 Set on a gentle hill that gradually slopes down to the Caribbean Sea on the south side of Anguilla, Little Butterfly has pretty views overlooking St. Martin and the blue, blue Caribbean Sea. Located within the secure walls of Janine Edwards' and her husband, high-profile architect Ian "Sugar George" Edwards' private villa, Papillon, Little Butterfly has an entrance all its own. The strong, rich, wooden gates lend an undeniable sense of elegance to the property. Ian "Sugar George" Edwards is a big name in the Caribbean. Having won prestigious awards, including "Best International Architectural Single Residence" at the International Property Awards, he's known for his sharp eye and keen sense of architecture and design. 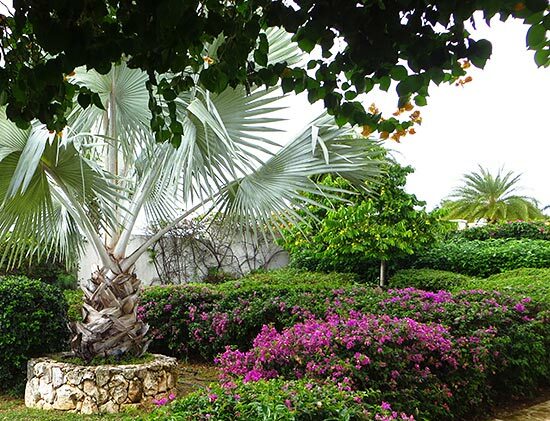 If the name Sugar George sounds familiar, you may have read the "Story Behind The Villa" of his Spyglass Hill Villa in Anguilla. In addition to Spyglass Hill, he's designed Tequila Sunrise Villa, Topaz Villa, Beachcourt Villa, the multi-million dollar property The Beach House, and his very own home, Papillon. Initially, Little Butterfly was intended to be a guest house for visiting extended family. Together, but very private and separate was the intention. And, they succeeded. As time went on and friends came to visit, they decided to open up their home to share with all who seek the comforts of home in Anguilla. With Janine and Sugar George as your neighbors, you know you are in good hands. 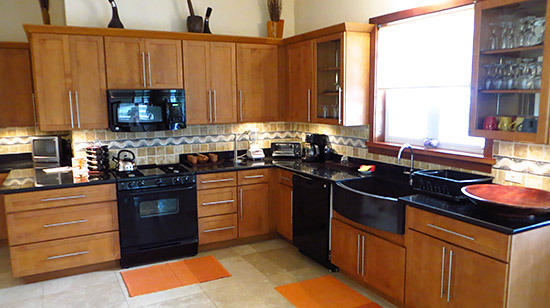 Janine (or Erlene, who works with Janine and Sugar George, is often on site) will help you with anything you need, including arranging activities and private chefs. Having known her personally for years, she is sweet, smart and always ready and willing to help. 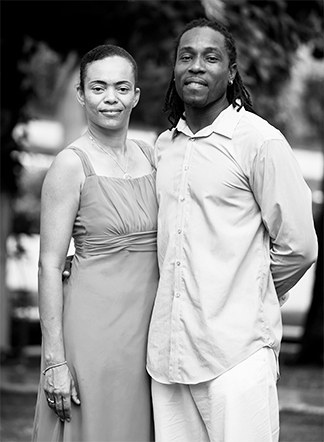 From the moment you set foot in Anguilla to the moment you leave (yes, Erlene will even meet you at your point of entry and arrange a taxi for you), and for everything in between, they are there. From the moment the gates open, you are met with manicured and well-maintained gardens to your left, tennis courts ahead, and the luxurious villa, elevated, taking advantage of the views. 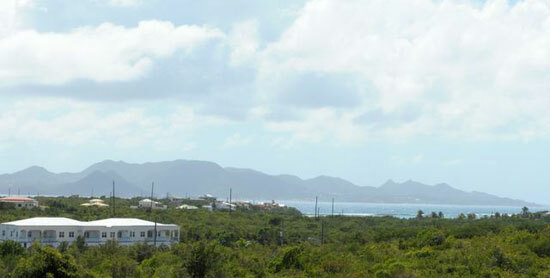 The villa has a large, wooden deck that looks out to neighboring St. Martin. 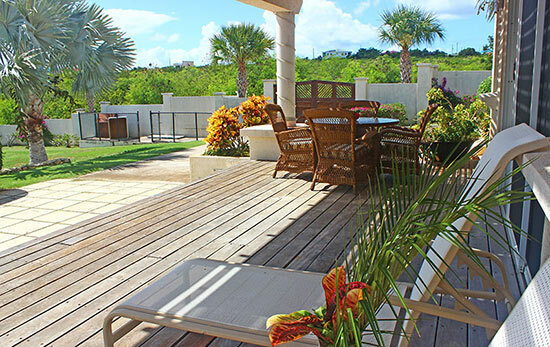 The deck has a comfortable dining area, lounge chairs and an outdoor shower. The lounge chairs are perfect for tanning, the outdoor shower ideal for cooling off afterwards. The dining area? 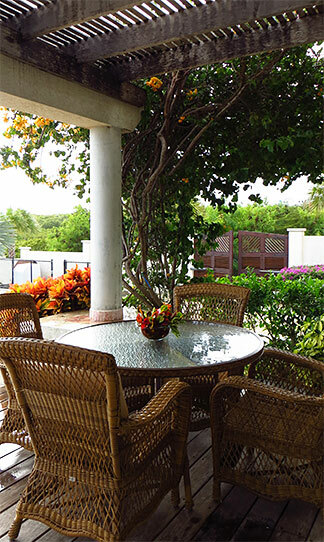 Dine at home (a great way to save money on an Anguilla vacation), AND al fresco I might add! The Edwards can also accommodate you with a BBQ grill. Covering the dining area is a sturdy pergola, which provides just enough shade from the sun. The use of wood adds a certain charm and coziness to the villa. Adorned with colorful flowers, at first blush, Little Butterfly is undeniably pretty. The Edwards like their guests to be as comfortable as can be, feeling right at home. Stop #1: The plush, comfortable living area. With a flat screen television (70+ channels) and high-speed wireless internet, living is easy and comfortable in Little Butterfly's living room. 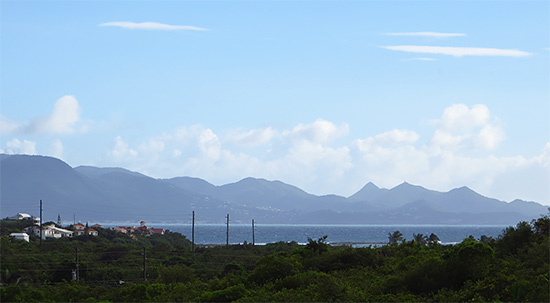 With plenty of windows, St. Martin (and its dazzling lights at night) is always in the corner of your eye. The floorplan is open concept and the villa is spacious, so everything feels large and comfortable. 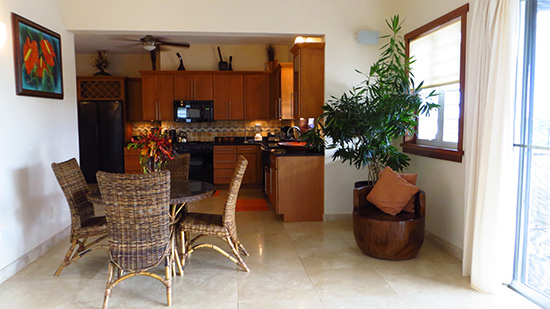 Just behind the living area is the dining room and kitchen, which is clean, brand new and finished in light wood. Blenders, toasters, coffee makers, even a television in the kitchen. If you like to cook, you're in for a treat! Isn't the kitchen so warm and inviting? Along a small hallway that runs behind the kitchen/dining area is the large master bedroom. With a king size bed, it's big and comfortable, especially with the use of top of the line, luxury linens. There is also a flat screen TV in the bedroom, complete with the 70+ channels. This villa is most often used by couples. But, if you are traveling with a young child or another friend, a rollaway bed can be arranged. 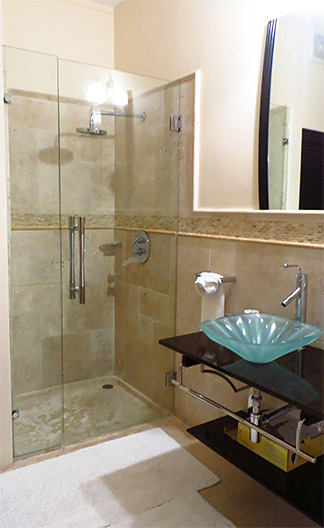 Opening up from the master bedroom to the master bathroom, is the oversized bathroom, complete with shower, jacuzzi tub and bidet. In one word? It's luxurious! The fixtures are high quality. I fell in love with the large, seafoam green seashell-esque sink! 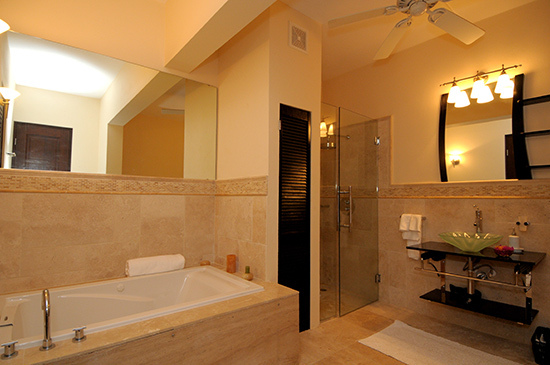 And, the tub is one you could easily spend a few hours in, especially with the tranquil lighting. A special touch: The lights don't merely "turn off" and "turn on." They dim! From the stonework, to the walk-in shower, to the cleanliness and modern-zen feel of it all, the bathroom just might be my favorite spot in the house. Staying Fit At Little Butterfly! 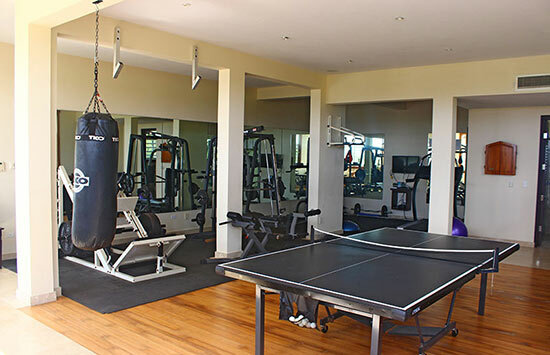 Lastly, a stay at Little Butterfly includes access to their gym, complete with ping pong table, elliptical machine, a sauna/sweat room and a punching bag. No need to worry about vacation pounds! Now, just one question remains... where is it? Centrally located, Little Butterfly is perfectly positioned to maximize exploring and living like a local. Because of its location right in the middle of the island, it makes a terrific "home base." You're only a short drive to the island's best beaches (Meads Bay is 15 minutes, Shoal Bay is 15 minutes) and super markets (convenience store Syd & Pete's is just up the street, and larger grocery stores are 5-10 minutes away). 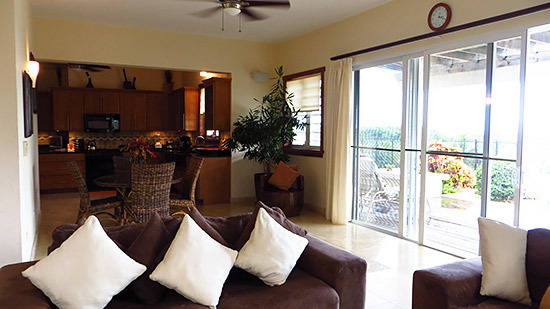 Little Butterfly is a top choice for couples seeking a modern villa with all of the comforts of home, hotel-quality amenities and service (including house keeping and laundry twice/week), and villa-like privacy and the freedom to roam and explore! 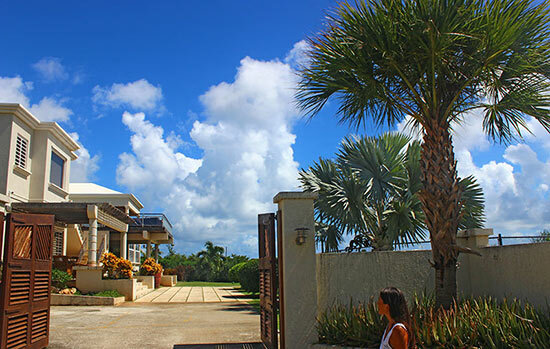 We appreciated the size of the villa and everything you had included to make it like being at home, even our morning hellos from Ace and Cypher and once in a while the cats..
We absolutely love Anguilla! It is the most beautiful of the islands in the Caribbean. Thank you for your hospitality and for letting us stay at "Little Butterfly." This was our little "home -away-from-home" this week, and we will miss it dearly. .. This was my 4th trip to Anguilla, was here in 2004, 2005 & 2007 and now 2011! I recently remarried and just had to introduce my new husband to my favorite place on Earth! 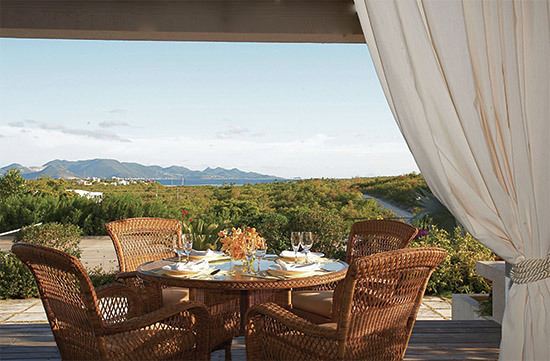 After travelling throughout the Caribbean and the world, there is no better honeymoon spot than Anguilla. Thank you for such a comfortable and peaceful, private, tranquil spot! Little Butterfly was perfect! My favorite of all places I've stayed on the island..